Welcome to Delia Row! You've never experience Savannah like this before. Tall ceilings and windows invite you in. 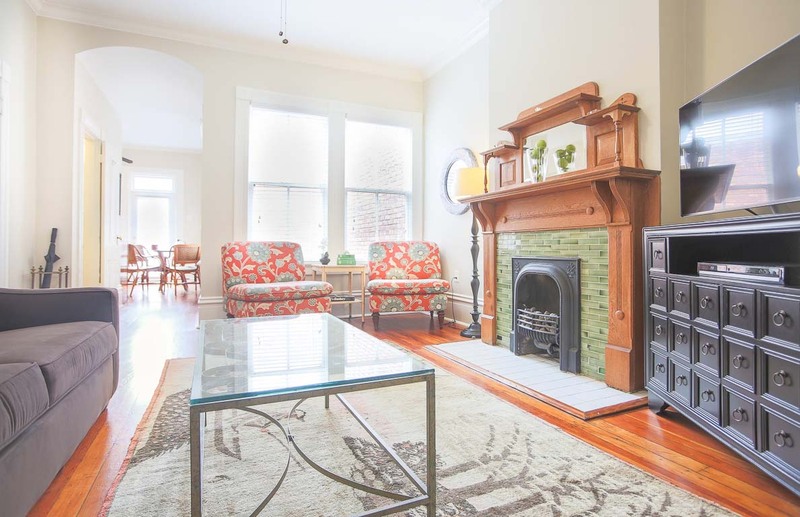 The original fireplace - now decorative - anchors the living room. Catch up on your favorite TV shows. The couch pulls out to a Queen sleeper. Finally catch up on your reading by the window. View of the kitchen. The full kitchen is stocked with all of the essentials. The washer/dryer is ideal for longer stays. The breakfast nook comfortably sits four. Welcome to your parkside retreat. 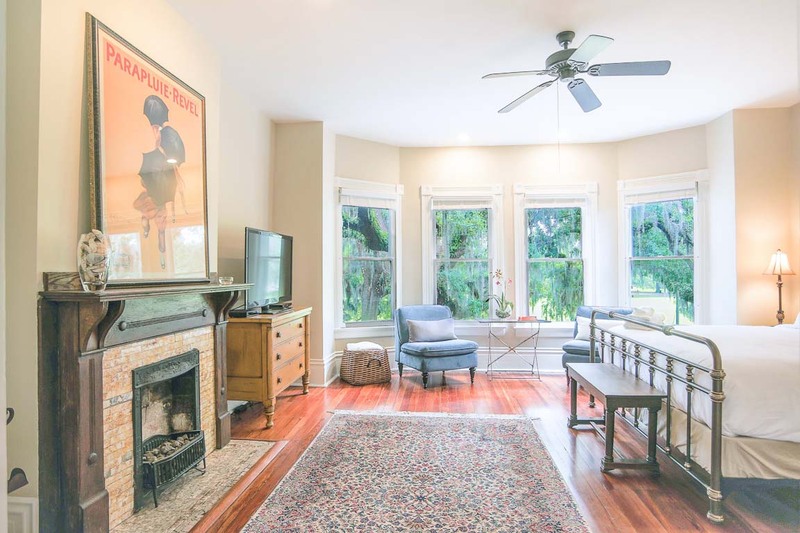 The large bay windows provide ample daylight. The fireplace - now decorative - is original to the building. Unpack your suitcase with the walk-in closet. Forsyth Park is just outside. The bed is a King. View the flat screen TV from the bed. View from the window. The perfect place to sip your coffee. View of the bedroom leading into the living room. The full bath has a tub/shower combo. View of the full bath. 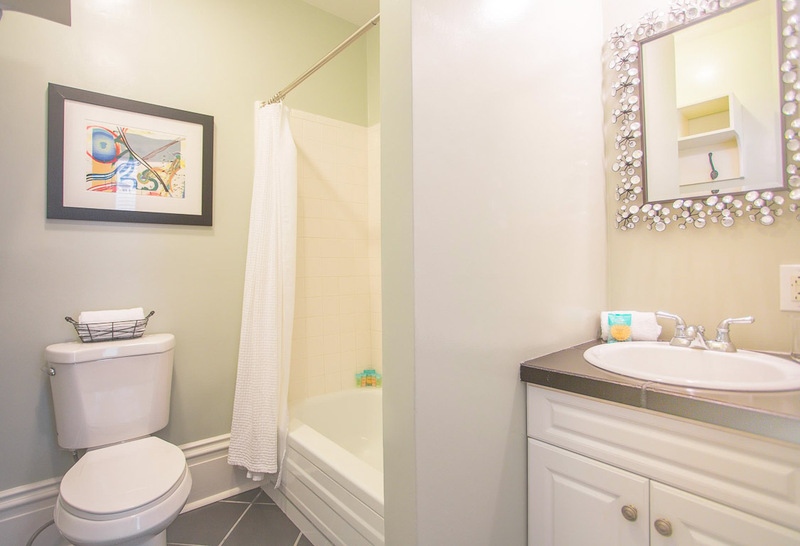 The bathroom is easily accessible to guests using the sleeper sofa. 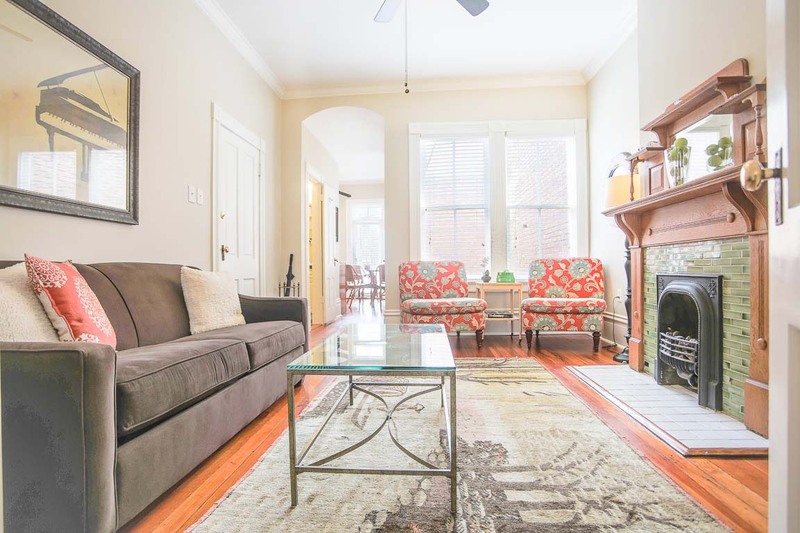 This beautiful second floor townhome has everything you'll need to feel like a true Savannah local. This amazing home will meet the needs of 4 Lucky guests. 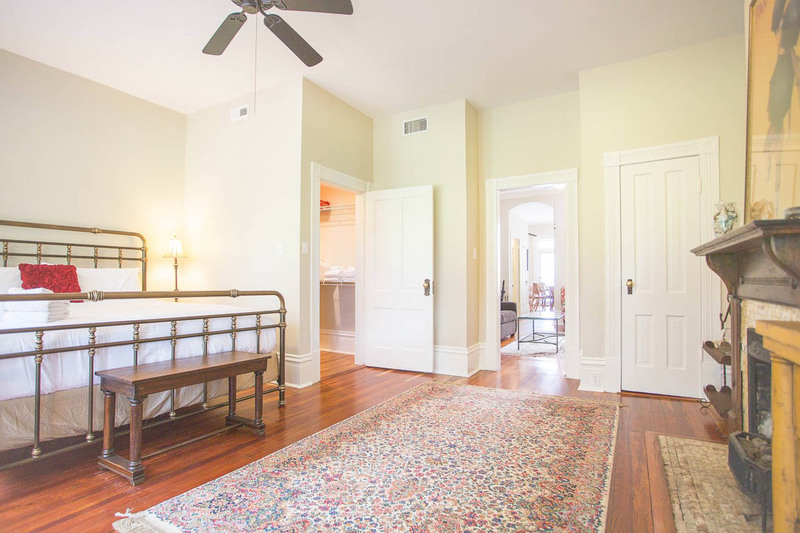 You’ll enjoy front door access to Forsyth Park, Savannah’s largest park and popular location for weddings, music and food festivals. Enjoy a little “me time” curled up on the couch with a good book, or catching up on your favorite shows. The living room is complete with a Queen size pull-out sofa bed, a 37" flat screen tv and DVD player - plus a bonus library of DVDs for your enjoyment. 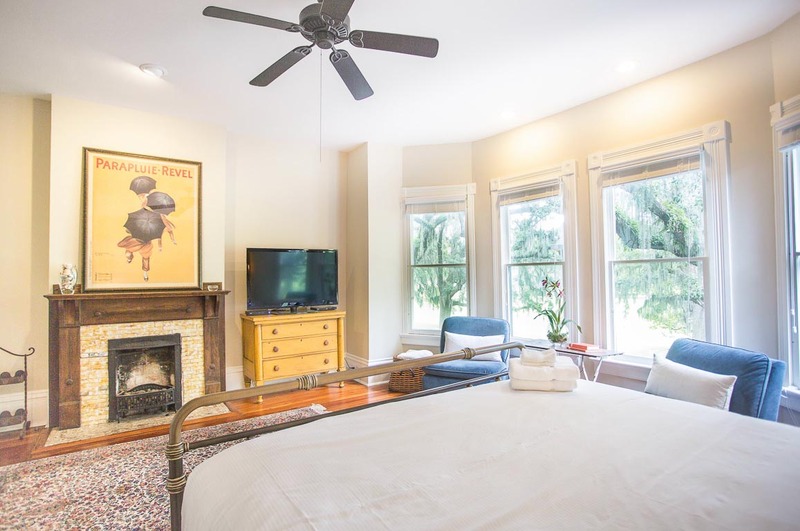 The bedroom has an additional seating area to enjoy people watching, reading a book, or just enjoying the 50” television. When it’s time to get some shut-eye, slip between the sheets of the luxurious King sized bed. Come morning, you’ll be ready for a whole new day of exploring Historic Savannah. Start your day of exploration with a walk across Forsyth Park to nearby Sentient Bean for coffee and a scone. Afterwards, head to Monterey Square for some antique shopping at Alex Raskin Antiques, or a tour at the infamous Mercer-Williams House. 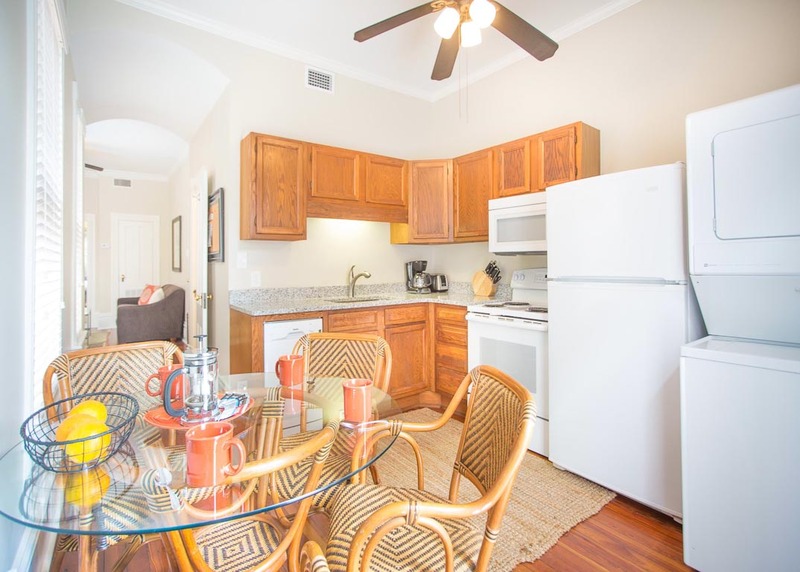 Whether you're in town for a quick business trip, a romantic retreat, or a longer stay with family, the Delia Row Townhome is the perfect choice! For larger parties, consider adding one of our other 1 bedroom homes located in the same building! 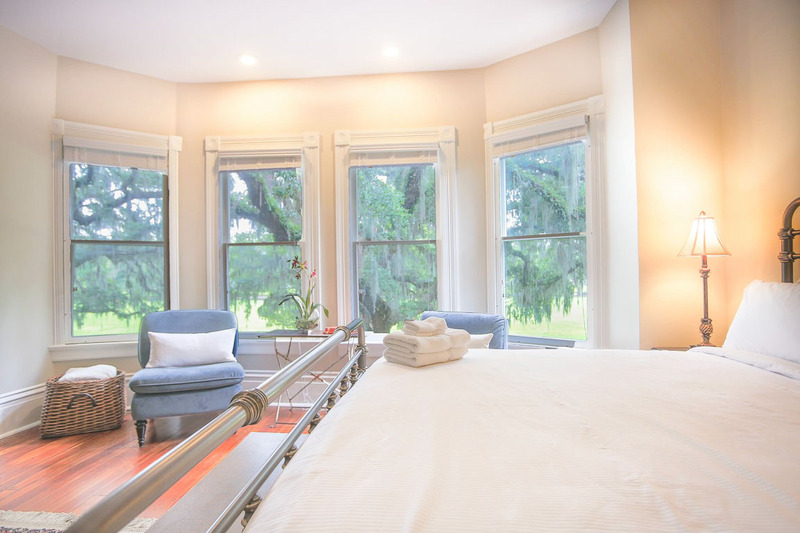 The bay window in the bedroom is an ideal spot to people watch or curl up with a book. There is plenty of non-metered parking surrounding the home, so there's no need to park in a garage or pay parking meters! The whole home has a free wi-fi network, so whether you're surfing the internet or watching a movie, we've got you covered. We made our annual trek to Savannah this year to participate in the Skidaway Island half & full marathon. It's the first time we've visited in March and the weather was simply perfect. 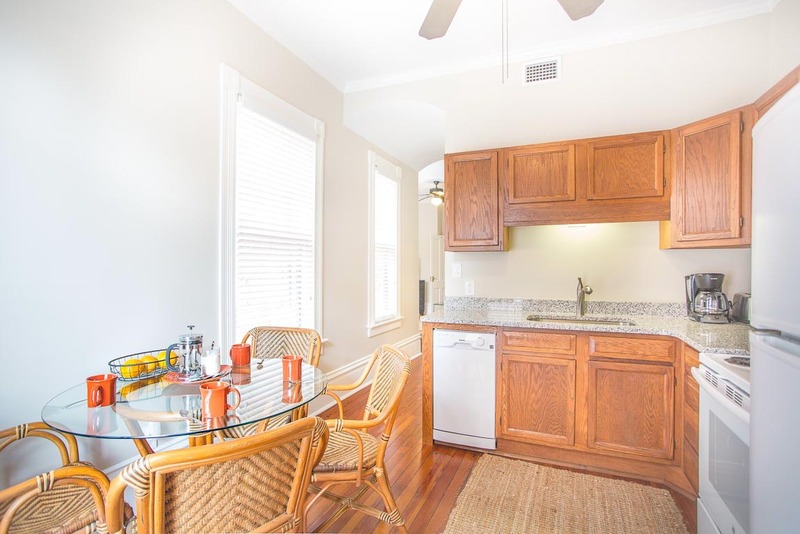 We love the location of Delia Row right on the edge of Forsyth Park and close to many local restaurants. The amenities are great for staying in a few meals and the space is beautiful. We will definitely use Lucky Savannah again next year! 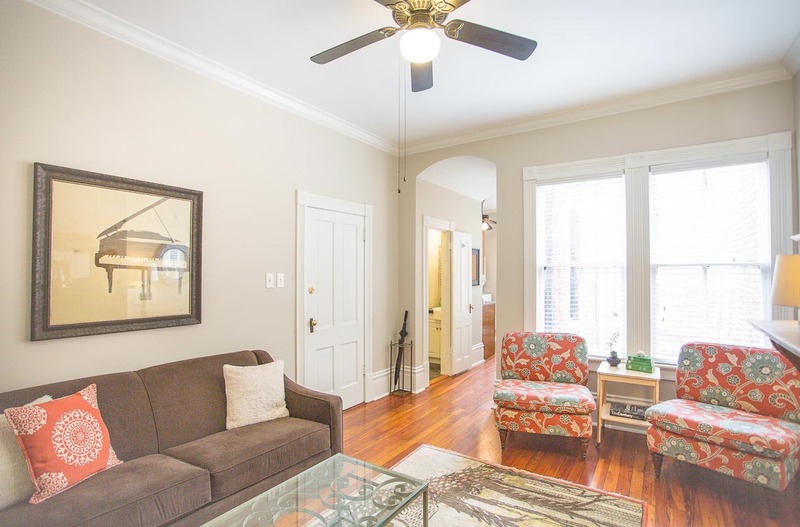 We rented 905B for the Savannah women's half marathon. Perfect location since the race started and finished in Forsyth Park. The rental had exactly what we needed! Also, a free bus stop is just a couple blocks away and it took us to downtown. Grocery store is a short walk or ride away. Awesome location and we will be back! This apartment is just wonderful. The location right on the park cannot be beat. It’s comfortably appointed with just about everything we needed. Parking was never an issue. We liked it so much we booked the same apartment a second time. There were a few things that could be improved - there are no smoke dectectors which is a life safety issue and no chain locks on the doors which we found very unnerving. Lucky Savannah didn’t change our door codes the second time we stayed here, which makes us wonder if they change them at all and how many people can just walk right in. And finally, the apartment could use a clock in the living room or bedroom. We absolutely loved our stay on Delia Row. The property is well-maintained and is stocked with everything you need. Although we were a little nervous about staying somewhere with no designated parking it was never a problem to find someplace to park nearby. We were traveling with our two kids - so the convenience of walking out your door and being in Forsyth Park was perfect! Plenty to do and see all around. We are definitely keeping this apartment on our list of places to come back to! 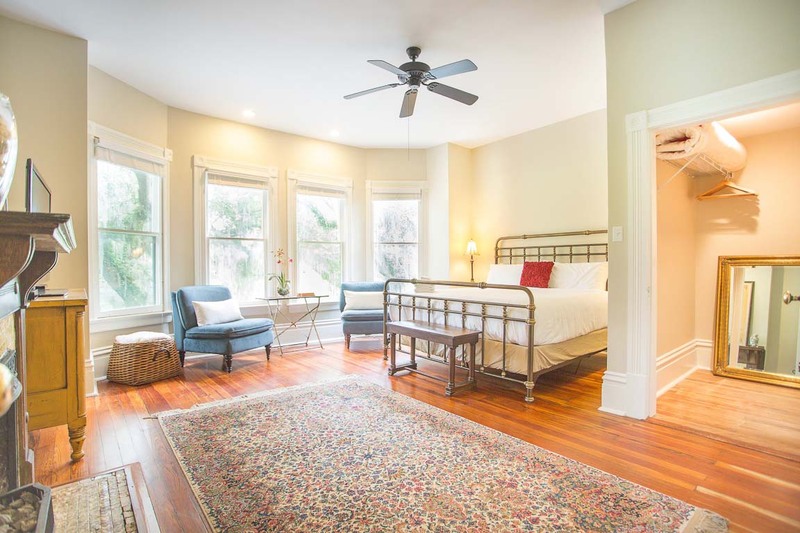 Our stay in the Delia Row house in Savannah was great. The management and maintenance team were very fast to respond when we did have trouble with the property. 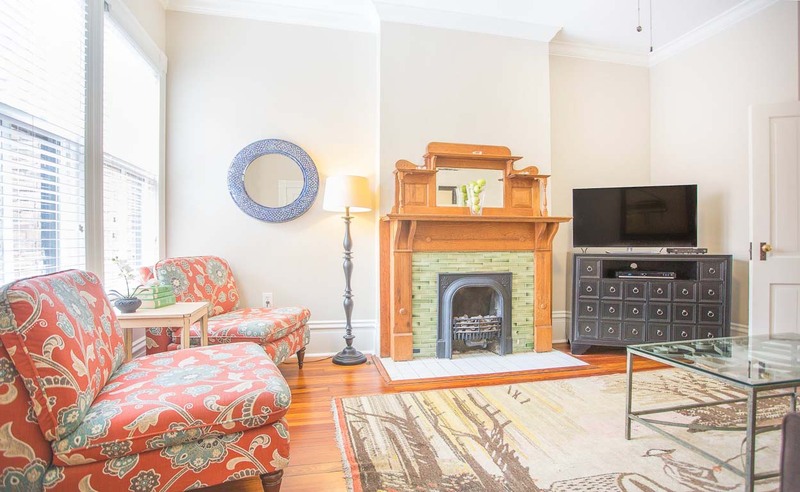 It is the absolute perfect location across from Forsyth Park and within walking distance to all the best sights in Savannah. It was clean and comfortable. Lots of Attention—Until I Needed It! Lucky Savannah called and emailed me multiple times after I booked. They insisted I confirm my booking, talk to one of their agents and read their unsolicited emails. All well before I got to Savannah. When I finally arrived in Savannah, Lucky Savannah was not to be found and neglected to provide me a code to get into the property. I waited more than 30 minutes I the hallway despite numerous calls and emails to LS—because of course, LS only inundates you with communication at their convenience. Very poor customer service. 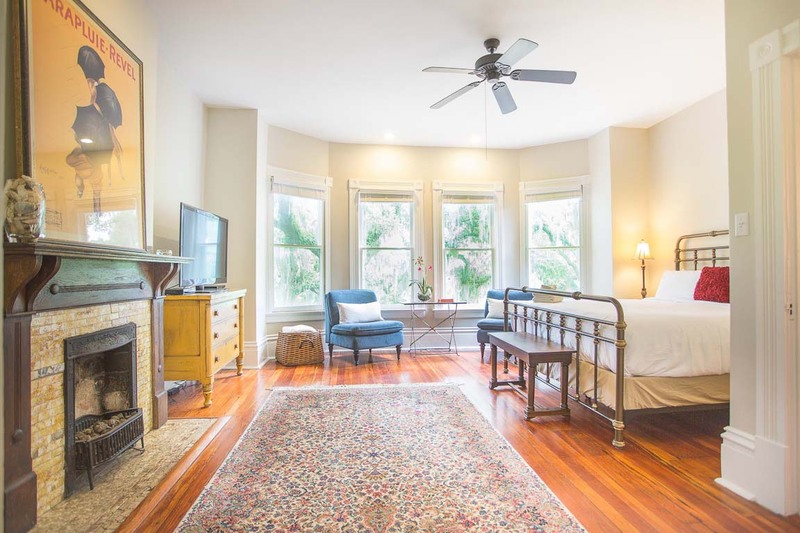 Our stay in Savannah was part of a 5 week trip to USA and this was probably our favourite accommodation and old town Savannah our most pleasant surprise. The apartment was clean, convenient location, with a well stocked kitchen and a huge bedroom. Washer and dryer just want we needed after 10 days on the roard. The stairs are a little challenging if you have suitcases but it's worth the effort. AC and lights were left on which was appreciated as it was hot and humid and we did not arrive until around dark. For good coffee, can't go past the Aussie owned Collins Quarter. Access via keypads all good and mobile checkout easy as well. I messed up our original booking but the Lucky Savannah staff sorted it out cheerfully and quickly. If it wasn't so far away, we'd like to visit again. Wonderful space in an awesome location! When we first arrived at the rental, we were surprised to find it much larger than expected. The master bedroom is gorgeous, the bed, pillows, and bedding so comfortable. Loved staying in a building that captured the character of Savannah, while also having modern conveniences. The kitchen is modern and stocked with all the kitchenware you might need to cook. The bathroom is nice, plenty of towels are provided. The unit was easy to access and in such a fabulous location. The unit was very clean when we arrived. We were able to park our car one street over and simply use the free DOT transportation which has a stop a couple blocks from the unit. Overall, I would highly recommend staying here! Loved 905 Whitaker. Lovely start to finish. I enjoyed my stay at this lovely spotless rental. The location was perfect and I felt very safe being there. I loved all the windows and privacy this rental had to offer. The walk in closet was huge but it could use a full length mirror on the back wall instead of a large square mirror on the floor. Had some problems with the WiFi connection and the TV lost signal for last last 2 days of my stay. Management was very helpful and brought over a hotspot connection on the first day but I was only able to get on the internet twice and this was a problem since I run an online business. Luckily the coffee shop around the corner had internet connection. Overall this rental was very well cared for and lovely. This apartment was so cute! Super clean and cozy. Great location and decorated perfectly. The large king size bed was so comfortable and inviting. We loved every aspect of staying in this rental. Very convenient. Easy walk to river district. I don’t know what to say,everything was perfect for our 3 night stay, we were very pleased! As we were checking in we were lucky to meet the caretaker who was very friendly and gave us recommendations and directions for us. Jim, we're so pleased to hear that your stay was perfect. Looking forward to your next visit! the home was perfect great location ive stayed all over the city this one is diffenantly top 3 i will diffennatly recommend this rental . Thank you for the recommendation, Ernest! We're happy to hear that you enjoyed this part of town. See you again soon! Excellent location, and large bedroom. Spotless clean. Would love to stay again. Simply the best. We look forward to having you again soon, Joni! Beautiful view and huge bedroom. King size bed and king size closet! Great place to spend your vacation. Be aware that it is on the second floor. No elevator. It was worth getting our luggage up the steps! Ron, thank you for choosing Lucky Savannah! We look forward to hosting you again soon. The location is great, walk, bike or ride one of the trolley/buses that literally passes the property. The bedroom is by the road and there is noise from the passing cars, so bring some ear plugs or a sound machine if sensitive to that. Photos are exactly how the place looks! 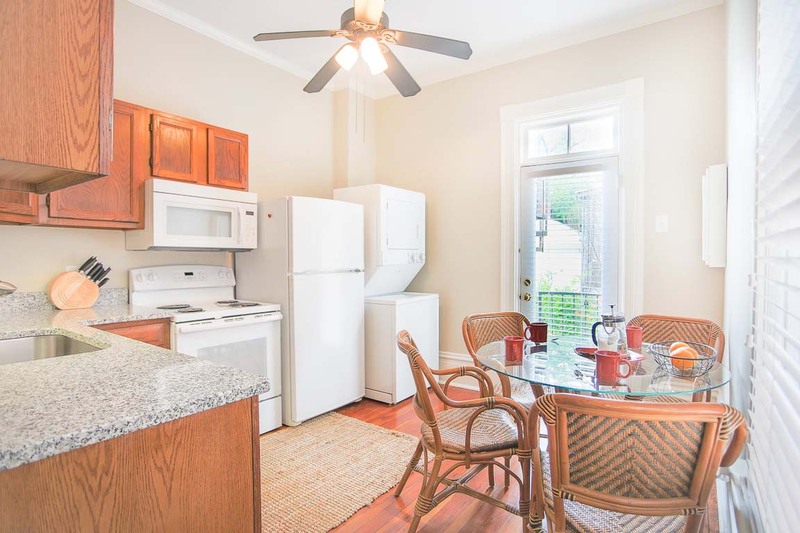 We enjoyed our stay in this charming and spotless apartment conveniently located on Forsyth Park. Hi Jeffrey! Thank you for choosing Lucky Savannah! We're so glad you enjoyed the location and cleanliness of your rental. Come and see us again soon! We enjoyed staying with Lucky Savannah at Delia Row. The staff at Lucky Savannah were very knowledgeable and able to answer questions about the area as well as send me recommendations for restaurants and tours. The apartment was perfect! It was clean and well stocked with towels, blankets, soap, etc. It was in a great location across from the less touristy side of Forsyth park. We loved walking the streets to the City Market and Riverstreet areas. Lots of things close by - grocery store, coffee spot, restaurants, etc. It was wonderful to wake up every morning and open the blinds and letting all the light in and seeing the park. We did have a car and parking was easy on the side streets. The overall experience was good. Accessing the unit, cleanliness, location, etc. were all as described. The location is convenient but far enough away that it is not in the middle of the hustle. It overlooks Forsyth Park. There is one major drawback... the unit sits right on Whitaker Street... though convenient, there is lots of street noise and the only bedroom is at the front of the unit. With the four windows facing the street, this creates massive amounts of street noise that can make it hard to sleep... especially if you want to sleep in. The place, location, and cleanliness were all phenomenal but we couldn't check in without downloading the app which was unfortunate and inconvenient. Loved the place and would return in a heartbeat though. Logan, thank you for choosing Lucky Savannah! We are so glad that you enjoyed your time here and your rental! Our app is the easiest way to communicate access instructions to incoming guests. It also provides a direct line of communication between you and our Guest Services. In case you are not a fan of apps, we also provide access instructions via email. So next time you visit with us, know that we have multiple options available to suit your needs! We've stayed in Deliah Row apartments several times. 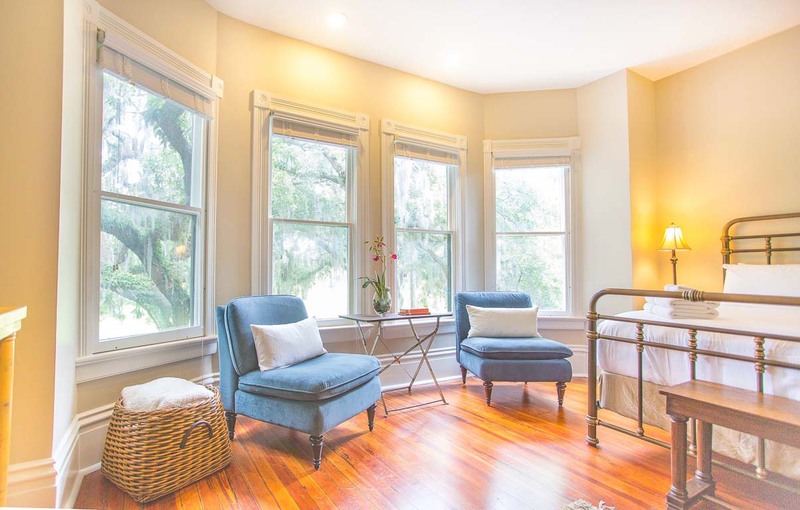 We enjoy the location across from Forsyth Park. The apartment is nicely furnished. Love the DVD collection! We'd love Kleenex to be provided. The apartment was clean, on time and had everything for us. The bed was comfortable. Being in front of forsynth park is perfect. We would definitely go back in the future. Our stay was enhanced by your gracious property, with minimal exceptions, our every need was anticipated. The Savannah-appropriate decor, the fabulous location on the park, half a block from Brighter Day and Sentient Bean and the Saturday Farmer's Market gave us a great local experience. The keyless entry was a great asset for us senior citizens.Free parking was never a problem, so long as we paid attention to the Savannah street cleaning restrictions. All equipment and appliances worked. Internet access was consistent and strong. We even had a dinner party for eight family members gathered to honor a local graduate...okay we had to use disposable plates but the pots and pans as well as seating arrangements were adequate. Closet was amazing. 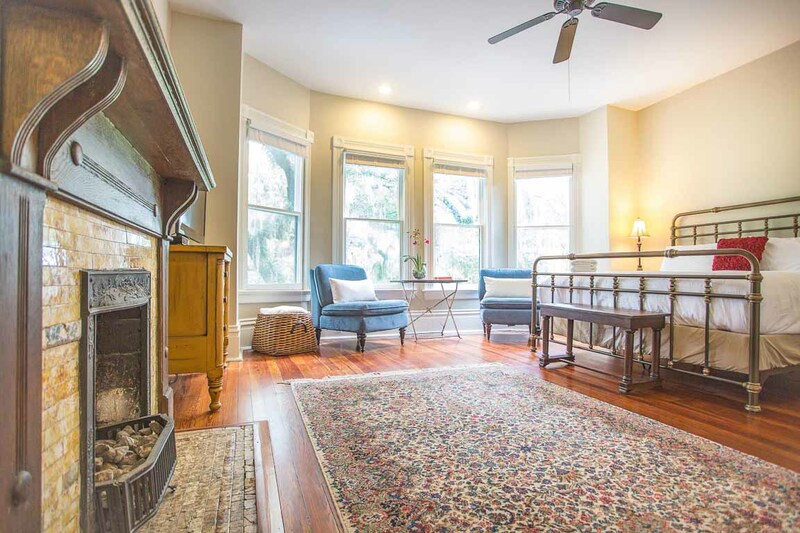 Respect shown for Savannah architectural assets--heart pine floors and deep baseboards--provided the perfect setting for an historic Savannah event in our family.We will be back. Hi Carol! Thank you for staying with us at Lucky Savannah! We're so glad you enjoyed the offerings of our historical city and home. Thank you for sharing how much you enjoyed the experience and we await the opportunity to host you again! This apartment was perfect in every way. Clean, beautifully decorated and contained everything one could need for a short stay. Comfy bed with views overlooking the park, small sitting room with TV, well appointed kitchen will full size fridge and washer and dryer. Loved it and we will definitely consider staying here again. Travel with kids. This rental provided everything a family could need close to public transportation a cross from a park and Easy to find parking. My kids loved the honey by the coffee pot it was a nice touch. I would recommend anyone staying here to heed their advice and bring your own soap/shampoo after a beach trip and getting sucked by rain. We were glad we had brought our own. Would recommend this property to anyone willing to walk/bus it to the main attractions. As it’s about a 20-30 minutes away from most of the sites. Great location. Great accommodations. Great price. Looking right out over the park and everything being within walking distance was exactly what we were looking for. Perfect. Felt like an official Savannah resident! We had an awesome stay! It was so refreshing to stay in an original Victorian rather than a modern hotel because it really gives you a feeling of how they lived so long ago. The unit was fully equipped & very roomy. The Owner was on site a lot so it was nice to talk to him & get to ask questions about the units & the area. Hi Dana! Thank you so much again for choosing to stay with us. We're so glad to hear you felt like a local at Delia Row. Please know that you're privy to our Friends and Family discount next time you stay with us. Looking forward to hosting you again soon! It was a great visit to the city. Our unit was in a row house across from Forsyth Park which made a lovely view and a place to walk for exercise. The trolley stop was right around the corner. The apartment instead was lovely and spacious. Great rental. Our first trip to Savannah & we were very happy! Here for a girl's weekend & enjoyed ourselves immensely! Nice walking distance to riverfront, cheap Uber ride if we felt like riding. Rental was everything we hoped for- cozy, clean, comfy bed. Very pleased with Lucky Savannah Rentals, would definitely recommend them! Hi Mary! Thank you so much again for choosing to stay with us. We're so glad to hear you enjoyed your first trip to Savannah at Delia Row. Please know that you're privy to our Friends and Family discount next time you stay with us. Looking forward to hosting you again soon! This was a last minute rental as our unit on Tybee Island was not available due to the hurricane. The management company was great, as was the owner Charlie. The unit was very clean and had everything we needed. Hi Mary! Thank you so much again for choosing to stay with us. We're so glad to hear we could accommodate you at Delia Row after your other rental fell through. Please know that you're privy to our Friends and Family discount next time you stay with us. Looking forward to hosting you again soon! Everything about our rental was wonderful. 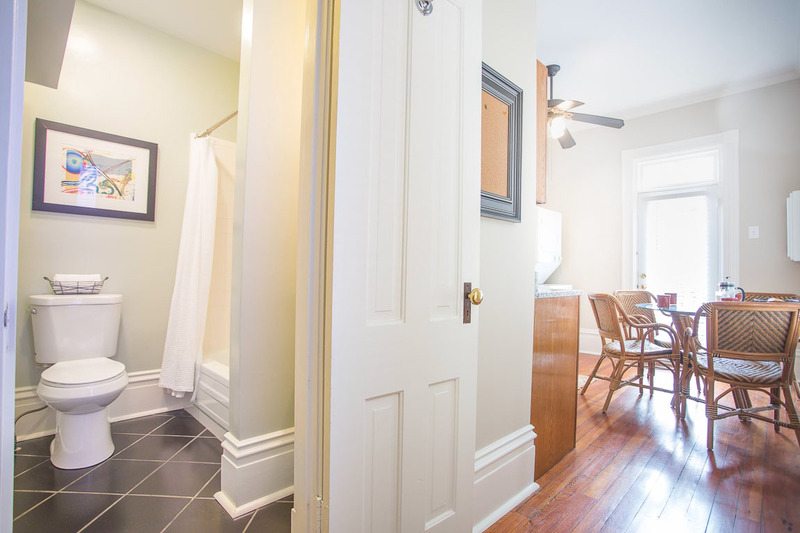 The row home was very clean and tastefully decorated. It had all the towels, dishes, etc. that we needed for our stay. We were able to find close off-street parking, and we walked to restaurants and shopping. A grocery store was close by too. We would stay here again if in the area. Hi Jodie! Thank you so much for choosing to stay at our Delia Row property. We're so glad to hear that the home was well-equipped with everything you could need for your stay. Looking forward to hosting you again soon! This lovely apartment couldn't have been any better. I believe this is one of the most beautiful places we have ever stayed in and we have stayed in many. The rooms were spacious, well appointed, lovely furniture and artwork. The place was well stocked with everything we could possibly need. Lucky Savannah was an excellent company to work with and helped me out when I made a mistake with my reservation. All in all a great stay in a beautiful apartment. Hi Judy! Thanks for staying at Delia Row. We're so glad to hear that the apartment couldn't have been better and that our staff was excellent to work with. We look forward to having you again soon! Hi Steve! Thank you for staying at Delia Row. We too recommend exploring the city through its center along Bull St, and are glad to hear you enjoyed your time in Savannah! Very pleased with out first rental through Lucky Savannah! This home is beautiful with everything that you could need. The owners make you feel at home with every little detail. Parking was easy and we loved the fact that everything was within walking distance. Thank you for an awesome stay! Hi Yvonne! Thank you so much for staying at our Delia Row property. We're so happy you were pleased with your visit and look forward to hosting you again soon! We had a great stay. The apartment was beautiful and Lucky Savannah is very well organized. Thank you so much for staying with us, Caley! We look forward to hosting you again soon. Easy, very responsive. Everything needed was included. Amazing views, great location, lots of light. This was a very nice place to stay. Good location and great views. Parking was a bit of a challenge at times. Thank you for choosing to stay at Delia Row, Tammy! We look forward to hosting you again soon. Hi Gregory! So glad to hear you enjoyed your time at Delia Row. See you again soon! It was so nice to return as a Savannah native. I'm so glad to have stayed across the street from my favorite park. The spacious rental was very clean, updated, and made our trip even more enjoyable. Hi Tina! Thank you for choosing to stay at Delia Row. We absolutely love how this home overlooks Forsyth and look forward to hosting you again soon! No reason to look any further!!! Immaculate; literally accross the street from Forsyth Park seen through huge windows; walking distance to restaurants, Savannah river walk and attractions. Pleasant and helpful owner. Thank you for staying Lucky, Linda! We look forward to your return. 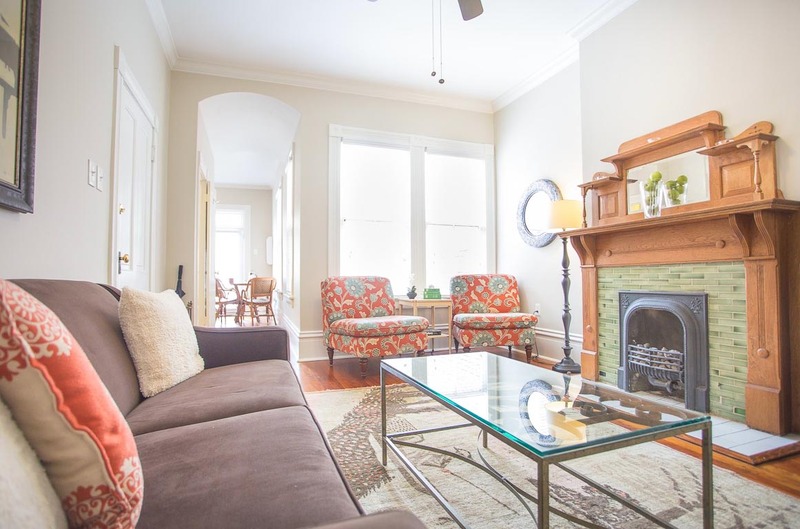 This was our second trip to this rental on Forsyth Park, and we couldn't love it more. The home is so beautiful and the owners have made it so accommodating and comfortable. We can't wait to come back for a third trip! Thank you for returning to Delia Row, Whitney! We appreciate your repeat business! View of Forsyth Park from bedroom, but street noise was not bad. Walking distance to a Kroger, and to the Lucky Savannah Trolley Stop. 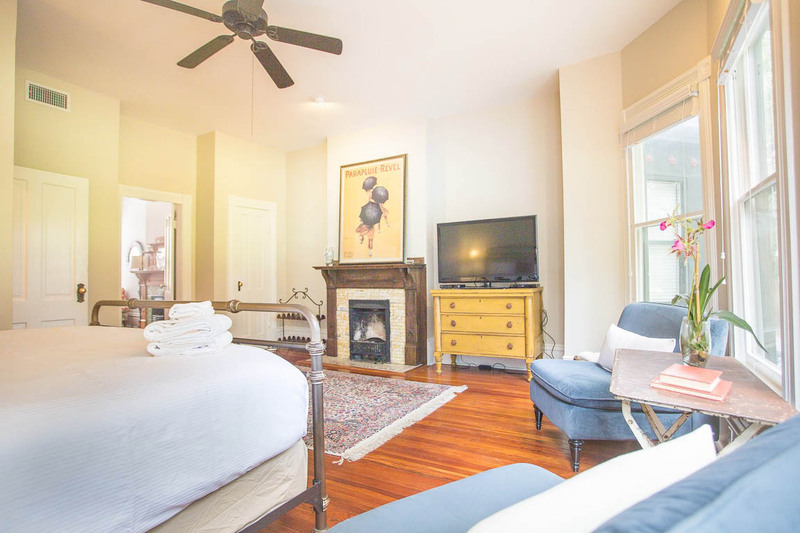 The property itself exuded a historic vibe and was appointed nicely with everything we needed. Hi Kris! Thanks again for booking with Lucky Savannah Vacation Rentals. We're so happy to hear that you enjoyed the location and look forward to hosting you again soon! We stayed at Delia Row for two nights. The apartment was exactly as advertised. 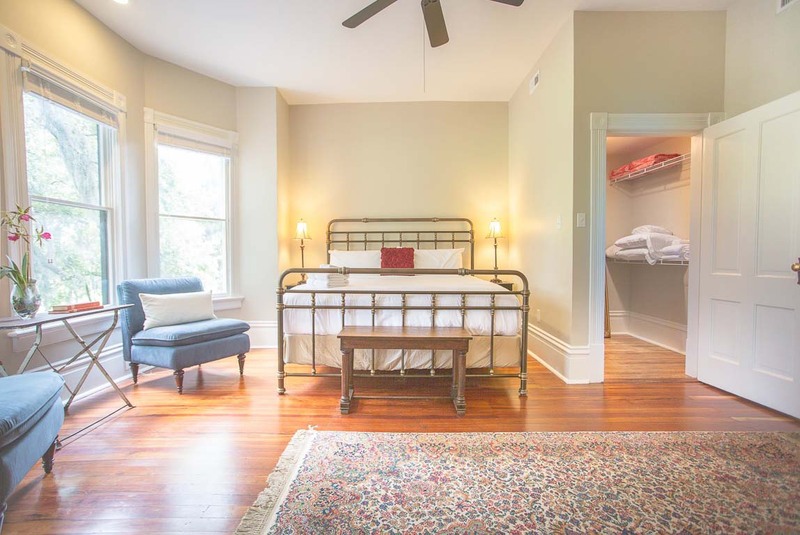 Super cute, great location, comfy bed and nicely appointed. 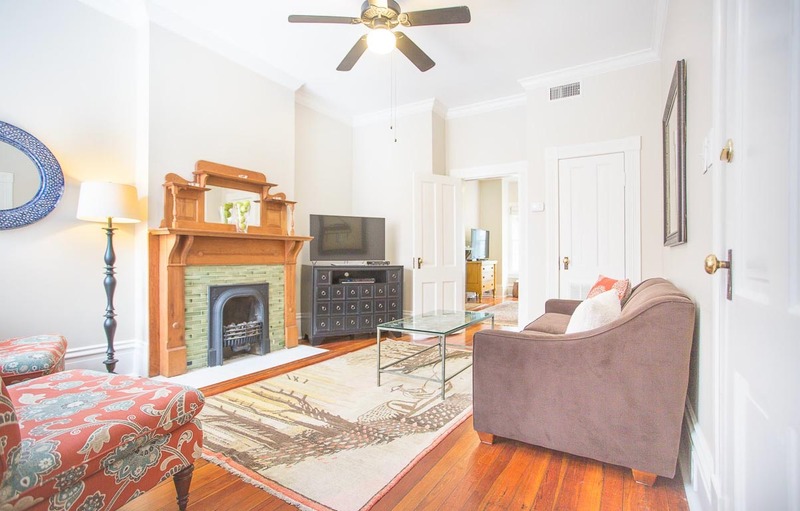 It is located directly across the street from Forsyth Park and is an easy walk to downtown. We would definitely stay here again. Thanks again for staying with us, Merrie! We look forward to hosting you again soon. James, thank you again for choosing to stay at Lucky Savannah and for your kind words regarding your time at Delia Row. We look forward to hosting you again soon! 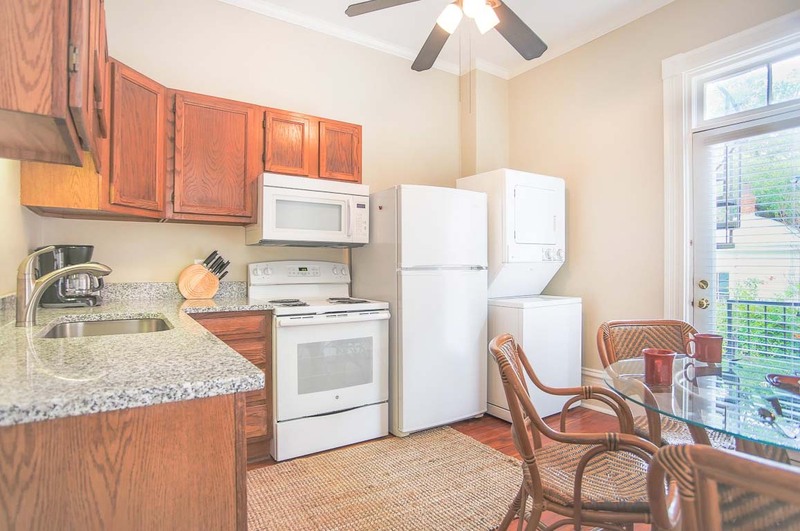 My girlfriend and I chose Savannah to visit for her birthday and I found this apartment available to stay. I booked it and am so glad that I did. Everything was perfect and the location was amazing. Being able to see the park from the bed in the morning was great. Would definitely stay here again. We're so glad you chose to book with us too, Sally! 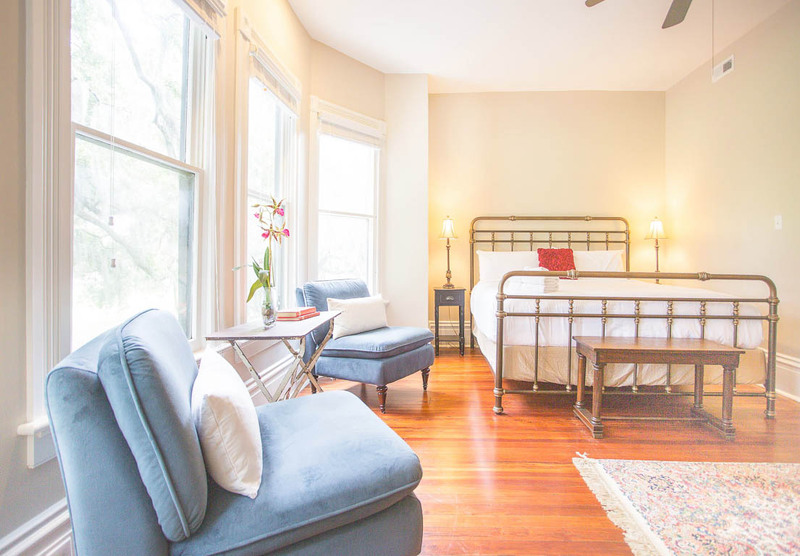 Delia Row sounded like the perfect fit for your vacation, and we look forward to hosting you again soon. Great location being park front and in walking distance to grocery store and nice coffee/breakfast spot. Management company great to work with and quick with responses to any questions. Place was clean and beds comfortable.kitchen well stocked. Bathroom is a little small but wouldn't stop me from renting again as everything else suited us so perfectly. Thanks for booking with Lucky Savannah, Danielle! We're so happy to hear that you enjoyed your time at Delia Row. See you again soon! Loved staying here overlooking Forsyth Park. Had all that we needed and it was very charming and clean. Lucky Savannah are great people to deal with. Thanks again for choosing to book with Lucky Savannah, Jill! We look forward to hosting you again soon.